This vegetable is my left over when I cook Sinigang na Baboy (Pork Sinigang) because I don't want it to be wasted. So I did cook it with the ingredients available in my kitchen. Luckily I have Garlic flavored longanisa in the fridge. Though the ingredients are so simple yet the taste was great, the combination of sweet and salty that you will surely love. 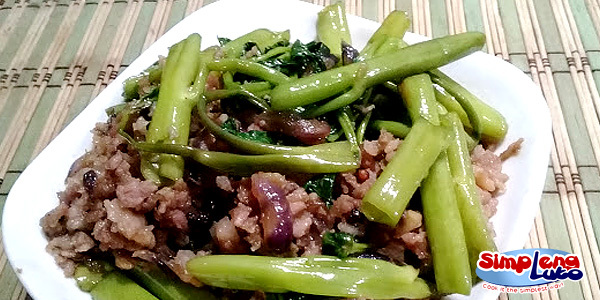 Another Simpleng Luto recipe you can add to your cook book. 3. Put the kangkong and add seasoning granule then mix well until cooked. - If you want it with a bit of sauce you can add small amount of water for an option then cook for a minute then SERVE!